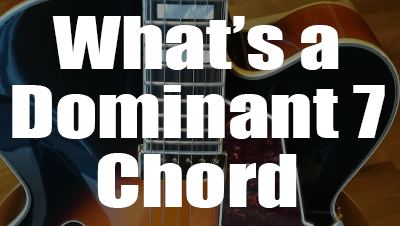 What's a Dominant Seventh Chord? A Dominant 7 chord is built from the 5th degree of a scale, which is the dominant degree. Let's take the C major scale as an example, the tetrad chord (four notes) built from the 5th degree is G7. You can see a dominant 7 chord as a major triad with an added flattened seventh. This means that a dominant 7 chord is built with root (1), major third (3), perfect fifth (5) and minor seventh (b7). Dominant 7 chords are written with a "7" after the name of the chord. Exemple with C7 = C dominant 7. The roman numeral V is used to indicate a chord built from the fifth degree of a scale. In that way, "V7" is being used when referencing the dominant seventh chord. Dominant 7 chords must not be confused with major 7 chords which are built with root (1), major third (3), perfect fifth (5) and major seventh (7). Indeed, the only one difference is in the seventh. What's the Harmonic Function of a Dominant 7 Chord? F, The b7 of G7 wants to resolve to the E the third of C (red arrow). B, The 3 third of G7 wants to resolve to the I of C that is obviously C (blue arrow). In a chord progression, a dominant 7 chord is generally used for the V chord leading to the I chord. For example, you can get V7 – Imaj7 (major key) or V7 – im7 (minor key). The degree as a roman numeral. The name of the scale degree. Let's start with dominant 7 chords in “open positions”. Open chords are chords that include one or more unfretted strings. They are generally learned first by guitar beginners. 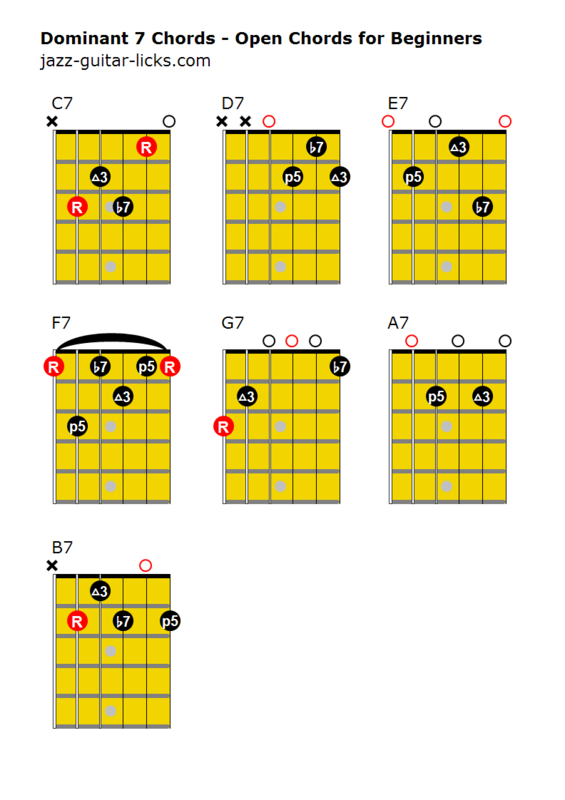 The eight diagrams below represent the most basic guitar positions. You will find on the right, a YouTube jazz backing track for practicing dominant 7 arpeggios, scales and chords. Drop 2 Voicings are one of the most used chords in jazz because in comparison with drop 3 and drop 2-4 chords, they are less stretchy and more easy to play. Drop 2 chords are built by dropping the second highest voice of a chord down to the bottom. Drop 3 chords are built by dropping the third highest note of a close voicing. They are greatly appreciated by guitarists for comping and soloing. They can be very useful in music composition and arrangement. The particularity of drop 3 voicings is that the bass notes are on the fifth and sixth string and there is a string skip between the two lowest notes. Drop 2 & 4 chords are constructed by dropping down to the octave the second and the fourth note of a chord in close position. They are not the most used by guitar players, but, they can be interesting for composition and arrangement.